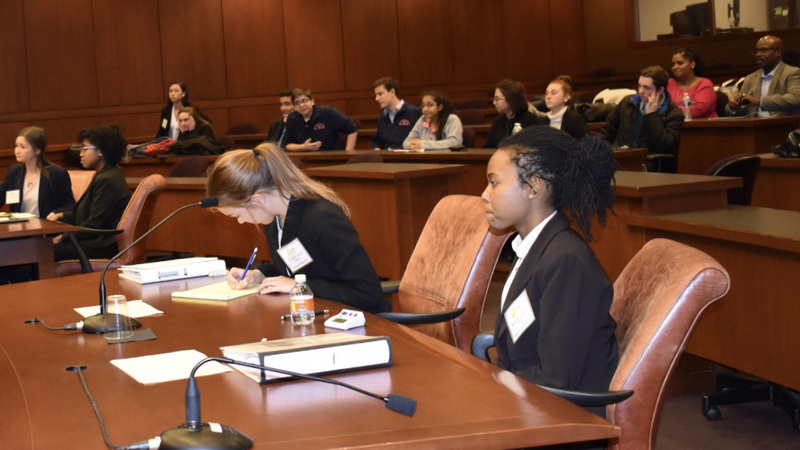 Racial disparities and defamation were among the underlying factors driving this year’s Maryland Youth & the Law (MYLaw) MY Moot Court competition. High school students representing Towson High (Baltimore County), Franklin High (Baltimore County), Rockbridge Academy (Montgomery County), Bard High School Early College (Baltimore City), and Huntingtown High (Calvert County) were asked to think critically about the cases, Maryland v. Lancaster and Williams v. Chadwick, whose fact patterns covered a range of complicated issues, during a daylong competition held Saturday, November 10, 2018, at the University of Maryland Francis King Carey School of Law in Baltimore. Rockbridge and Franklin advanced to the final round, in which Franklin ultimately prevailed. “The teams argued the two cases – one criminal and one civil – in an appellate style,” explains Truffer, noting that the participants faced additional challenges by not knowing which side of the argument they would take prior to reaching the courtroom. “It was a superb example of oral advocacy at its best,” said Truffer. This year’s MY Moot Court problem addressed a Fourth Amendment issue under the Terry doctrine and a First Amendment defamation claim involving a limited purpose public figure analysis. A star high school football player (Lancaster) openly criticized school administrators for racial disparities in school discipline. Along with several other teammates, he held up a sign in protest during the singing of the National Anthem and posted on social media alleging that the principal (Chadwick) is racist. When Lancaster’s car is seized from the school lot for a parking violation, a school resource officer searches Lancaster’s person and locates a small bag of marijuana. Lancaster was arrested, and argued that his Fourth Amendment rights had been violated. In the wake of Lancaster’s arrest, the student body organized a walk out and rally. At the rally, and later during a panel presentation, a former student (Williams) spoke about racial amicus in school discipline at the school. That spring, Chadwick spoke at her retirement dinner and she accused Williams of lying and racism. Williams then sued Chadwick for defamation of character. Chadwick argued that Williams was a limited purpose public figure, therefore the court must find that Chadwick demonstrated actual malice to move forward with the defamation claim. “Thanks to Shelly Brown and Megan Jurdi at MYLaw for organizing the event, and to MSBA members Pat and Chris Lambert for their excellent coaching of the prevailing team, Franklin High,” says Truffer. Since 1975, MYLaw (formerly the Citizenship Law-Related Education Program) has been teaching youth about the law and legal system, and helping to foster appreciation for the American Judicial System through programs such as MY Moot Court, MY Mock Trial, MY Law Links, MY Teen Court, MY City Council Page Program, and MY Law Academy. Learn more at www.MYLaw.org.